Find out all of the Barcelona handball livescores for every handball game Barcelona have played in the current season and every season before it. See how Barcelona has gotten on in the 2017-18 league table, cup competitions, international tournaments and friendly games including the Europe - Champions League, Liga Asobal, Copa del Rey, Copa Asobal, Super Cup & World - Super Globe Club Handball Championship handball tournaments! Get every handball score, handball fixture & handball match stats for Barcelona in the 2017/18 handball season only at ScoresPro – the best livescore site for Barcelona handball! 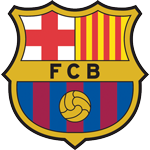 Get the latest Barcelona news, handball scores & more. See how Barcelona has performed in Europe - Champions League, Liga Asobal, Copa del Rey, Copa Asobal, Super Cup & World - Super Globe Club Handball Championship in the 2017/2018 season only at ScoresPro!